Vin Diesel Facebook Followers count: The Fast and Furious fame Hollywood actor, Vin Diesel Reaches 100 Million Facebook Followers. The Facebook Founder & CEO, Mark Zuckerberg congratulate by posting greet along with their First Meet Photo. Scroll down and get that Facebook post and Photo. Vin Diesel is one of the stars of forthcoming “Fast 8.” He recently achieves one of the biggest milestones on the social platform. He hits 100 Million fan followers on the Facebook page. For that, he got more greeting from lots of fans and celebrities. Mark Zuckerberg is also one in that team. Diesel’s most popular Facebook post is found based on the like, share and with interactions. It is on the time he shared a post about his “Fast and Furious” film partner, Paul Walker’s death. 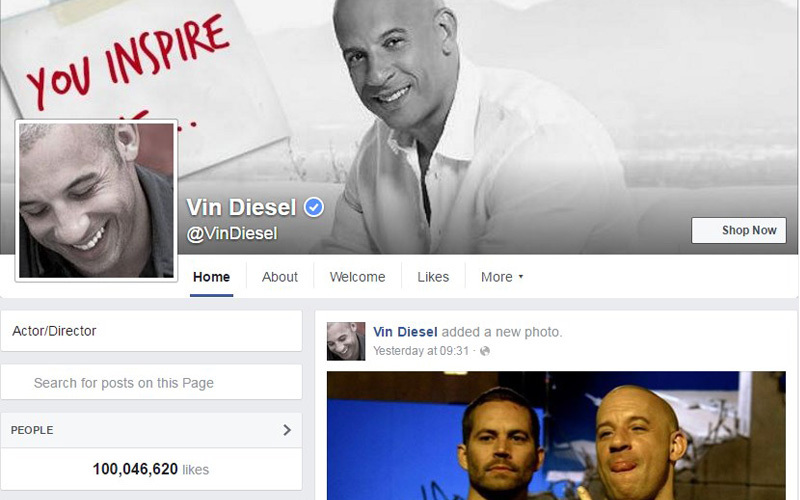 Mark Zuckerberg posted “Congrats Vin Diesel on hitting 100 million followers! Here’s one of my favorite photos of us — trying on your glasses the first time we met.” on July 30, 2016. Stay tuned for More Updates about Social Media Tech & Funs!